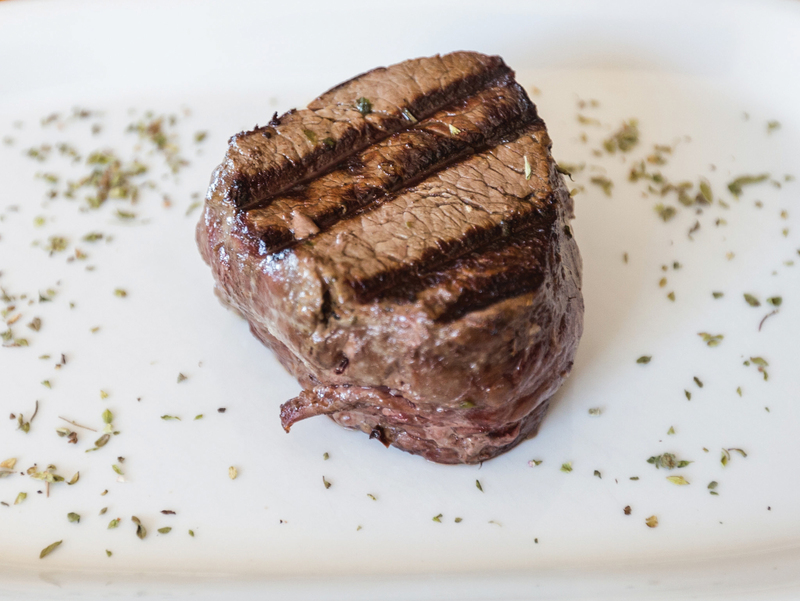 We call it chump, but the correct word for it is tenderloin (for the fancier ones) or “that meat that we only eat when we attend weddings” for the rest of us. 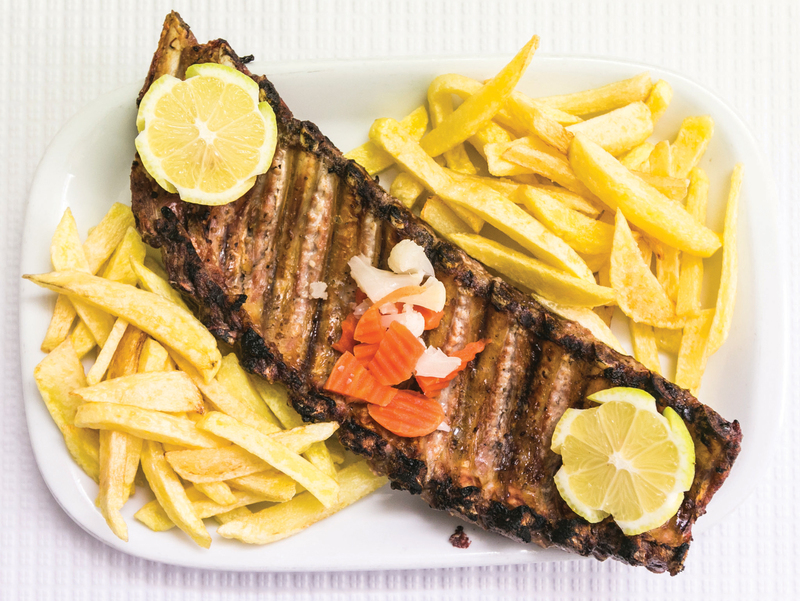 The perfection of the parallel lines that you will see is the result of the parrilla, which is a grill that is frequently used in South America and whose art can be appreciated at the La Paparrucha, an Argentinian restaurant (a nation known for its meat) at Príncipe Real (a neighbourhood with plenty of restaurants). At lunch, on week days, there’s a buffet (12,50€), but at night the restaurant – with a fantastic panoramic view over Lisbon – is devoted to more intimate dinners. The last time we counted there were seven Cova Funda restaurants in Lisbon, which tells us pretty much all we need to know about the lack of originality of the owners of these restaurants and the ground floor architecture of the city. But the truth is that many of these “accentuated concavities” are gastronomic references. Praça do Chile’s Cova Funda serves some fine pork fillets, Penha de França’s speciality are the boiled snails and this one, in Rua Augusto Machado, is famous for its rump steak. Repeat after us: potatoes are vegetables, so in theory this is a salad. 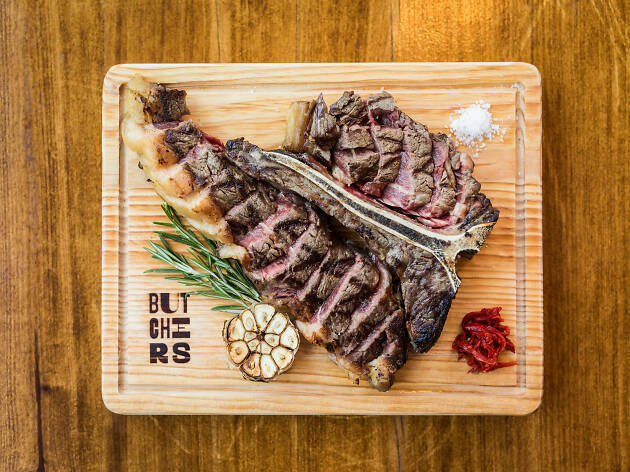 If you are one of those people who like the anatomically perfect meat – this is, with bone in it – you must try this Butchers T Bone Steak, the newest meat temple in Parque das Nações. The meat, tenderized for 35 days, only stays in the grill for a few moments – a doctor’s visit, really – and arrives at the table rare, resting on a board, already sliced and accompanied by chili peppers, mayonnaise, garlic and grilled lemons. 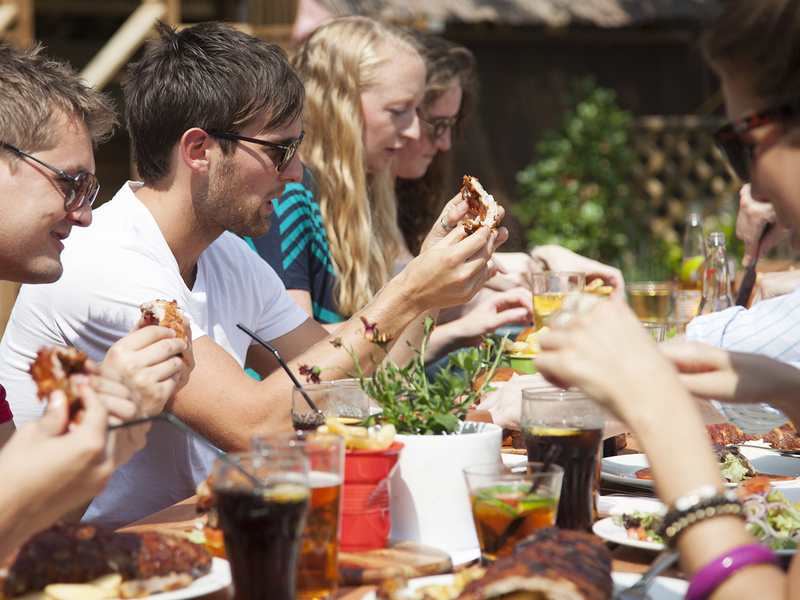 It’s almost 500 grams of meat, so have some sense and share it with someone. Liberace, Richard Clayderman, Zé dos Cornos. All generations have its piano virtuosos and our Zé, surname “dos Cornos”, is one of the restaurants Lisbon takes most pride in. It works daily at Rua dos Surradores, number 3, and most dishes include green beans rice – that must be one of the best students at the Ponte de Lima’s conservatory – super thickened. There are some who prefer French fries, an option which allows us to enjoy the meal without ever getting our hands dirty with the steal of the cutlery. Does this hamburger look familiar? 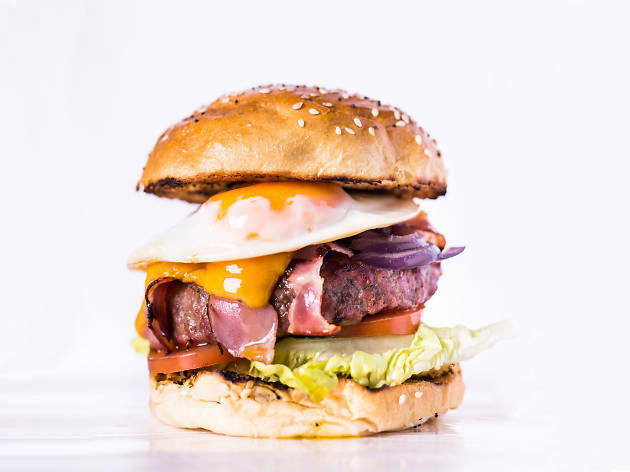 It starred in our 411 edition, which was dedicated to the best burgers in Lisbon. 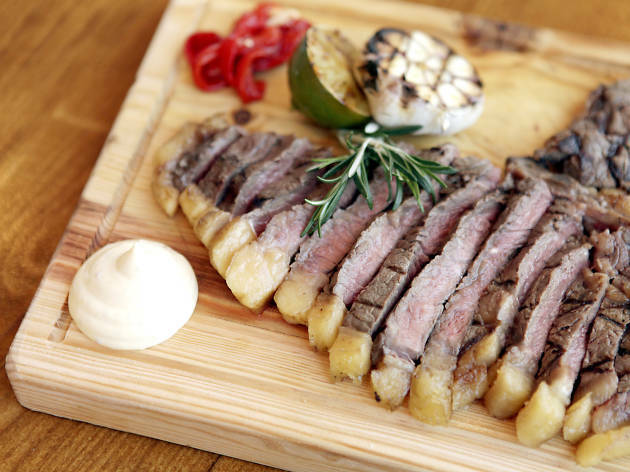 It is the only one in Sala de Corte’s menu, a restaurant where you cook with a Josper, a device (half grill, half oven) which gives the meat a unique flavour and scent. 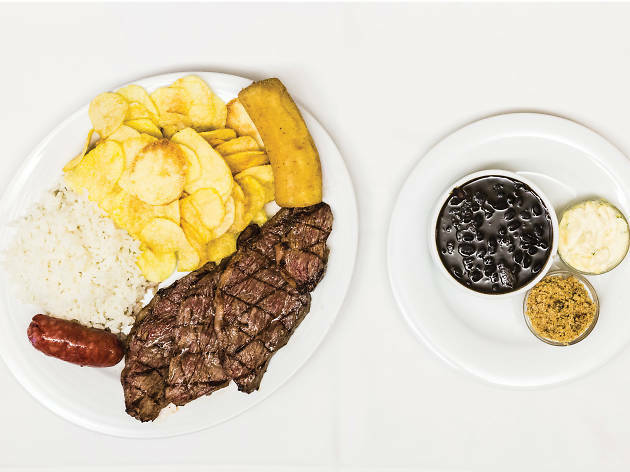 Our food critic, Manuel Ferreira Gavetão, described it in two words – “something else” – and devoured it in between bites. The smell of sun screen, chlorine, sea and roasted chicken could be part of a fragrance called “Summer Scents”, due to the olfactive nostalgia we feel when we are passing by a grill restaurant. The roasted chicken takes us to the end of a beach day and the three months of vacation when there was so much time to kill that our life was a genocide of the clock hands. We will never have those days back, but we can always buy chicken a la Rio de Mel (except Mondays, for that specific day there’s no salvation yet). The mythic restaurant grill in Avenida da Igreja serves what is considered the best chicken on the spit in town: crispy skin, tender and moist meat, sauce that will make you bite your fingers (lick, we’re sorry, lick!). It is the classic barbecue grill “corner” restaurant, foggy and agitated, always has a queue and it’s best to make a reservation. 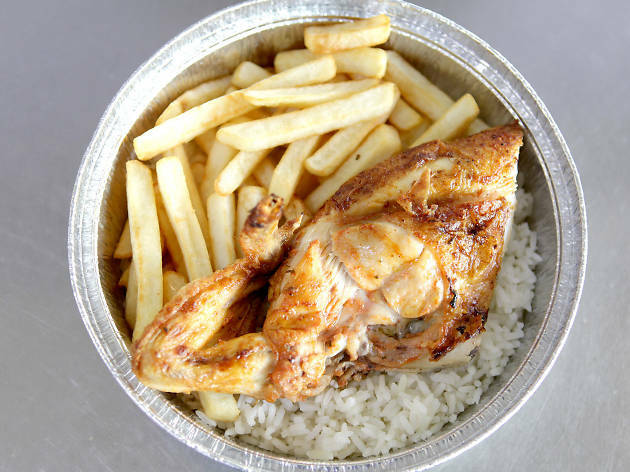 If you want an economic lunch ask for the half chicken with rice and fries option (3,50€) and eat it at your desk while you keep thinking how you are going to spend those ten days of vacation you have left. 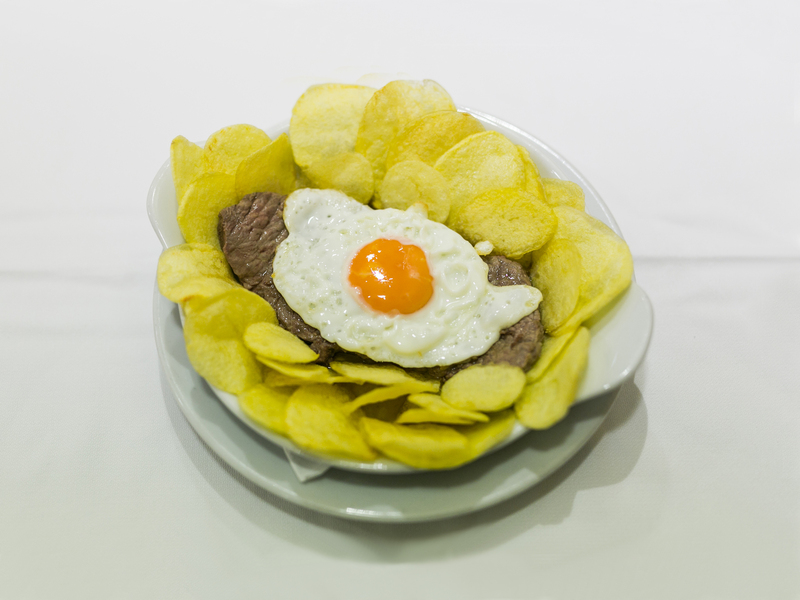 The name of this historic restaurant at Rua das Portas de Santo Antão looks like one of those cases where the definite article takes on an imperial tone: just like Frank Sinatra was “The” Voice, this restaurant is “The” Barbecue restaurant. As part of the list are several carbon specialities, the most popular being “The” chicken on the spit. 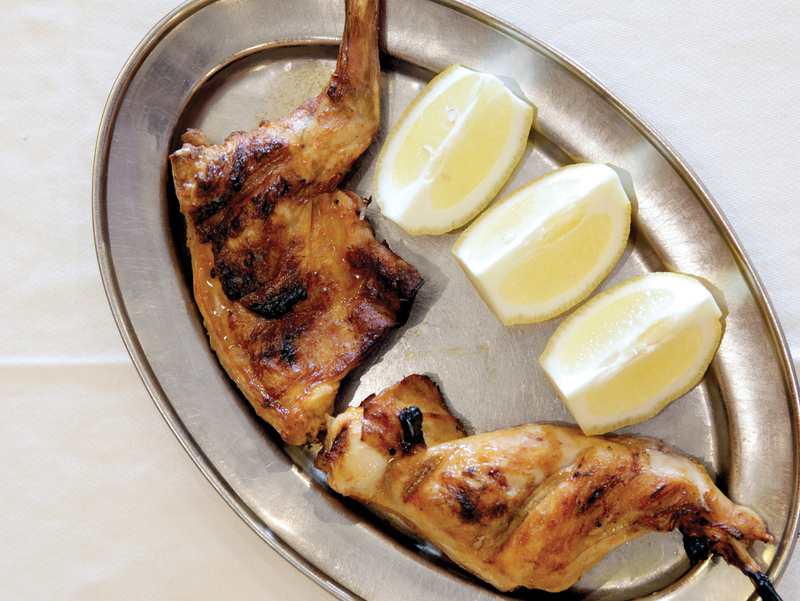 But there are other names on the menu you can explore, such as the seasoned lamb or this rabbit barbecue. It comes in a platter, the brisket and the leg washed down with a savoury butter sauce and lemon sauce. The skin and bones ratio makes it more challenging than the chicken on the spit, but it’s worth the while. O Churrasco is a restaurant where grandparents take their grandchildren rather than a place where sons take their girlfriends, but it is rewarding to realize that are still places like this in Lisbon: with cloth towels, waiters wearing a uniform (note the chief’s yellow jacket) and compliments such as “can you be so kind”, “excuse me”, “enjoy” – a rarity in places where you cook with incandescent carbon. It is often the escape goat when the person in charge of the grill can’t maintain the flame alight. If you want a fiery grill, seek Sparcks and Weber carbon – those are the best in the market, according to a study Deco made last year. It is always good to have a trustworthy butcher and to make friends with a man who can handle a big knife and always has blood stains on his shirt. There are several good butchers in Lisbon, but Loja da Quintinha, in Linhó, is a reference for several chefs, such as Chef Kiko. 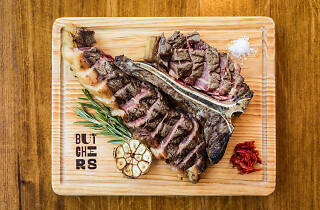 António Pinheiro’s butchery, at Bairro da Madredeus, is one of Alexandre Silva’s favourite’s. We also recommend Herdade do Freixo do Meio’s butcher’s, at Mercado da Ribeira, that only sells biological meat from free-range animals. At Alvalade’s wood there are several grills where you can show your inability to start a fire until someone, out of despair, makes you use firelighters. Keil do Amaral’s picnic area, in Monsanto, is a great place to get your hands dirty with carbon, much like Moinho do Penedo’s picnic area, nearby. São Domingos de Benfica’s wood also has grills where you can shine, or like they say in Portugal “puxar a brasa à sua sardinha” (“fire up your sardine”). The burger bandwagon rolls on and on. We've seen the rise and fall of hot dogs, ribs and kebabs, but the cravings for burgers in Lisbon never seem to die. 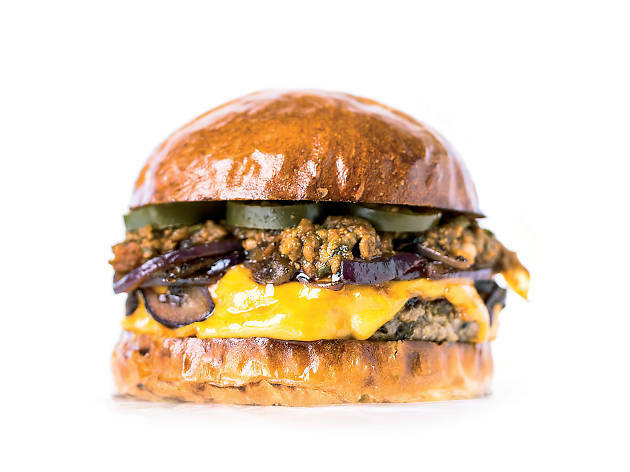 Here, in our humble opinion, are the best burgers in town. Do you agree with the choices?